TALL SHIPS AMERICA is seeking a summer intern who is interested in working in a unique nonprofit environment. Interns support the TALL SHIPS CHALLENGE® Race Team in various components of the TALL SHIPS CHALLENGE® Race Series, which is an annual series of tall ships races and maritime port festivals that celebrate our rich maritime heritage and traditions and which inform the general public about the transformative power of ‘Adventure and Education Under Sail®.’ Interns join the race team in working with the vessels, crews, trainees, port organizers, US Coast Guard, and others to execute a successful series of races and port festivals for traditional sailing ships. 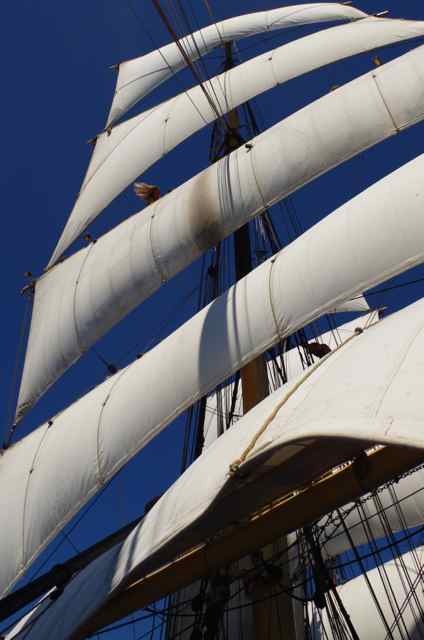 Our summer intern will join TALL SHIPS AMERICA in Toronto on June 26th and will depart from Erie, PA on August 26th . As a member of the TALL SHIPS CHALLENGE® Race Team, we expect that the intern will support festival operations and dockside vessels in Toronto, ON (June 28 – July 1); Cleveland, OH (July 11-14); Bay City, MI (July 18-21); Green Bay, WI (July 25 – 28); Kenosha, WI (August 1-4); Sarnia or Midland, ON (August 8-11); Kingsville, ON (August 15-18) and Erie, PA (August 22-25). There is an option to stay on board through to Brockville, ON (August 29-September 2) if the applicants’ availability allows. 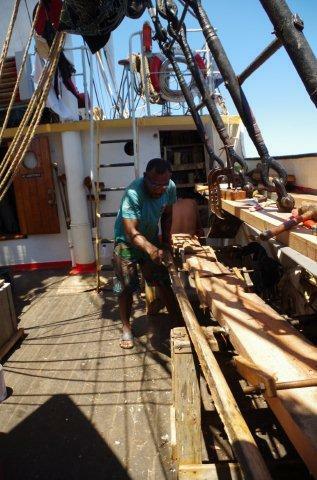 Our summer intern will be expected to sail as a trainee or volunteer crewmember on a tall ship between ports. These cruises will include three Tall Ships® Races and may include additional port stops. While enrolled in a vessel as a trainee or volunteer crewmember, you will be under that vessel’s care and supervision. Some paperwork may need to be completed and signed before joining the vessel. Successful candidates will be organized thinkers, motivated workers, enthusiastic learners, confident communicators and mature young adults. Sailing or sail training experience is very helpful but not required. Aspiring photographers and writers are welcome. NOTE: Interns are responsible for their own transportation to Toronto and home from Erie or the intern’s last port. Erin Short, TALL SHIPS CHALLENGE® Director: erin@tallshipsamerica.org. Please include a cover letter, resume and references. Additionally, please submit a brief writing sample that focuses on what value you would bring to TALL SHIPS AMERICA and what you would like to gain from the internship experience. The tall ships have certainly drawn in the crowds to Woldenberg Park. There has been much to see with the tall ships, Coast Guard, and Navy ships all in town. Much to do as well. As the crowds moved out on Saturday evening we prepared for the Tall Ships® Tricentennial Gala Fundraiser. The event celebrated 300 Years of New Orleans on the decks of the ships and dockside at Woldenberg Park. Patrons were greeted with drinks and a taste of the many local dishes that New Orleans has to offer. Every celebration requires a cake and Chef Tariq Hannah of Sucré produced his rendition of a 4-masted Barque. The cake was cut just in time for the fireworks and everyone was able to enjoy the rest of their night dancing among these great ships. It was a great way to celebrate the city’s long maritime history. More food was on the menu for Sunday’s activities. The Tabasco Global Kitchen Cook-Off paired tall ship cooks and Navy/ Coast Guard Culinary Specialists with chefs from local restaurants around New Orleans. Teams were challenged on their ability to prepare a local seafood recipe using the special ingredient, Tabasco sauce. Representing the tall ships, we had Oliver Hazard Perry cook, Donna Vestuti and Picton Castle challenger, Aaron Samet. Donna was paired up with Chef Chris Lusk, “The Louisiana Seafood King” and Aaron was paired up with Chef Keith Frentz of Lola Restaurant. Both teams had 30 minutes to create their masterpieces. All teams were able to plan their dishes beforehand and ingredients were ready for them to start. The sounds of kitchen rustle filled the room. None of these teams have ever worked together but with the proper communication (just like on a tall ship) they were able to work as an organized unit. The sizzles started as fish met fry pan and the smells that filled the room definitely made you hungry. At the final seconds teams added their finishing touches and presented them to the panel of judges. All teams had a great showing but it was the team of Sgt Scott Meadows, USS Kearsarge, and Chef Mike Nelson, GW Fins, who took the judges taste buds. Food is commonality for everyone and it was a great way to end our time in New Orleans. Thanks to all of the tall ships, small ships, Coast Guard, and Navy ships that made their way to New Orleans for this great event. We certainly drew a crowd that will leave a lasting impression on the people of New Orleans and the surrounding area. Lynx hosted three of Tall Ships America’s interns during the 2008 TALL SHIPS CHALLENGE® Race Series. Applications are still being accepted for this summer’s TALL SHIPS CHALLENGE® Race Series in the Great Lakes. Check out the application here! 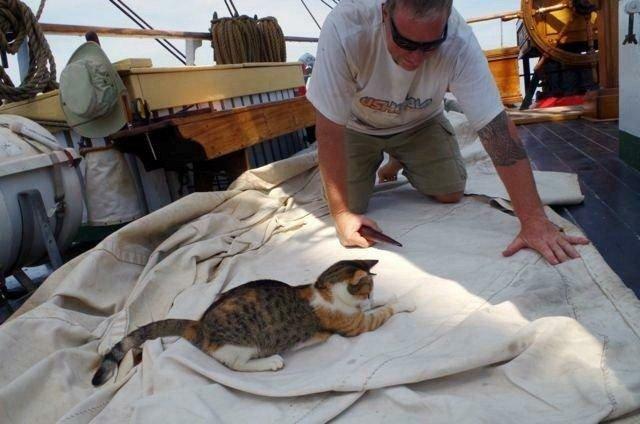 The square rigged topsail schooner Lynx has been designed and built to interpret the general configuration and operation of a privateer schooner or naval schooner from the War of 1812, the original Lynx having been a “letter of marquee” Baltimore Clipper commissioned during the opening days of the war. Serving effectively as a blockade-runner and offensive weapon of war, she was among the first ships to defend American freedom. Dedicated to all those who cherish the blessings of America, Lynx sails as a living history museum, providing inspiration and resolve at this time in our nation’s history. She is fitted with period ordnance and flies flags and pennants from the 1812 era. To compliment her historic character, the lynx crew members wear period uniforms and operate the ship in keeping with the maritime traditions of early 19th century America. 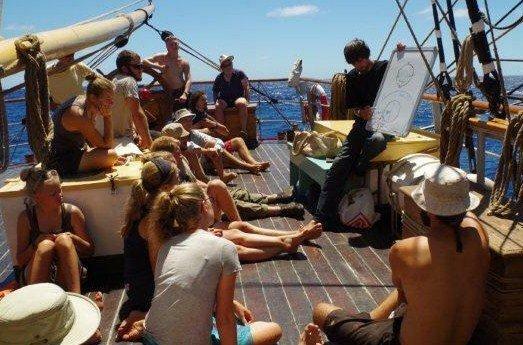 Lynx also operates as a sail training vessel to serve as a classroom for the study of historical, environmental, and ecological issues. In addition, she undertakes “port to port passages” that lead to personal growth and awareness through the experience of life at sea aboard a traditional sailing vessel. School groups from elementary age through college. Individuals of all ages. Elissa’s homeport is just under an hour away from Houston, TX where the 2016 NCAA Men’s Basketball Final Four and Championship will be played this weekend. Our intern, Micah Wisen, is a current student at Syracuse University and is pulling for a big victory for his Orange on Saturday! In 1975, a rusted iron hulk lay in the waters of Piraeus, Greece. Nearly 100 years earlier, she has sailed the world’s oceans as a proud square-rigged sailing ship. Cut down, leaking and decrepit, she waited a cable’s length from the scrap year. Today, Elissa remains one of the hallmarks of maritime preservation. 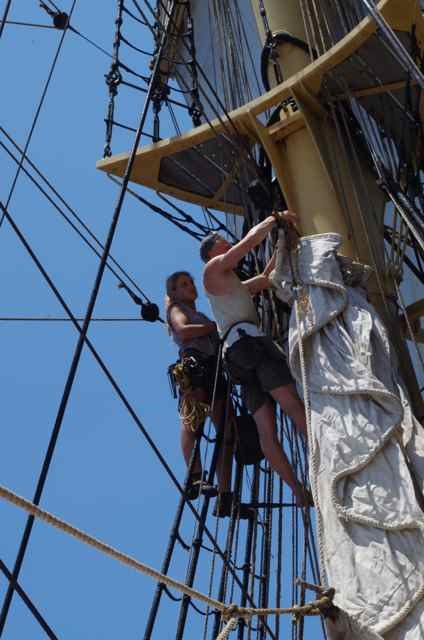 Lovingly restored and maintained, she sails again, continuing a far longer life than most ships are ever granted. She tests her readiness annually in a series of sea trials amid the oil rigs and shrimpers off Galveston Island. Working under professional officers, her volunteer crew completes an extensive dockside-training program. Today’s photo of Corwith Cramer was taken by a former SEA student, Jeremy Harlam, who was a trainee aboard the vessel in the Fall of 2011. Thanks for the great shot! The Corwith Cramer was the first ship built to the USCG’s regulations for Sailing School Vessels. The Sea Education Association (SEA), working through Tall Ships America, was instrumental in helping the Coast Guard shape these regulations. The Corwith Cramer was built in Bilbao, Spain, and it took the largest floating crane in northern Spain to launch her. She is a safe, stable vessel and a platform for SEA’s educational and oceanographic research missions. Along with the Robert C. Seamans, the Corwith Cramer is owned and operated by the Sea Education Association. 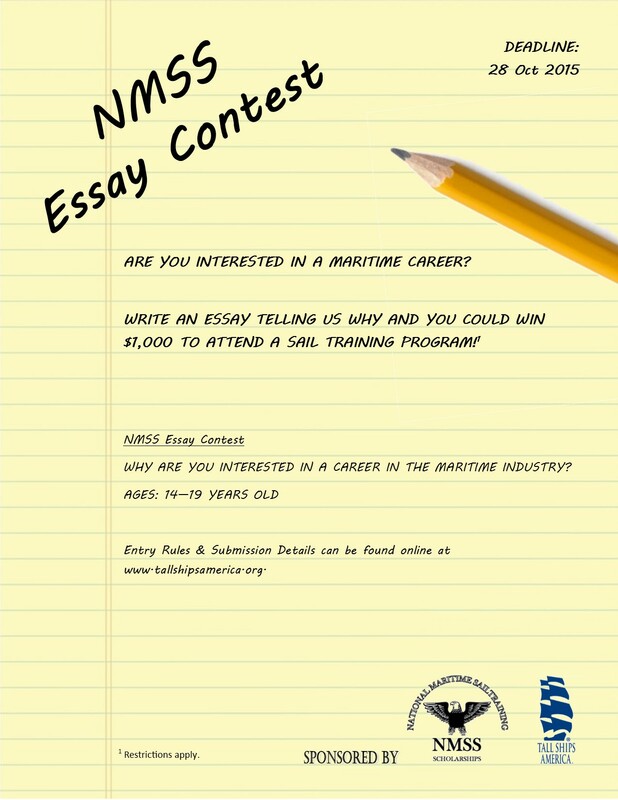 National Maritime Sailtraining Scholarships and Tall Ships America are holding an essay contest for maritime enthusiasts ages fourteen to nineteen. 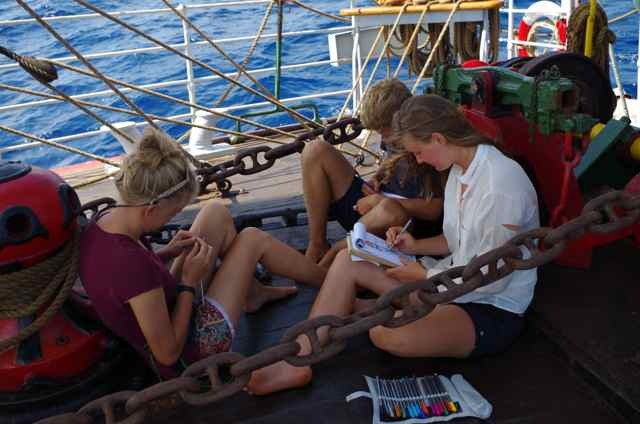 Teens are asked to write a 1-2 page essay with their response to the question, “Why are you interested in a career in the maritime industry?” The prize is $1,000.00 USD to complete a sail training program of their choice. Submissions must also include the completed NMSS Essay Form and will be accepted by email, mail or fax through October, 28, 2015. ESSAY TOPIC: The 1-2 page essay shall answer the question: Why are you interested in a career in the maritime industry? Entrants should indicate interest in attending a state run maritime academy or the US Merchant Marine Academy or in joining the maritime industry through apprenticeship programs. The essay should also address the value of participating in a sail training program towards obtaining the entrant’s career goals. DESCRIPTION OF PRIZE: Each winner will receive an award of $1,000.00 USD to be used towards the completion of an approved sail training program. All requirements must be met in order to claim the prize. ELIGIBILITY: This essay contest is open to teenagers 14 to 19 years of age. Applicants may live anywhere in the world but must be able to participate in an approved sail training program, as outlined below. Employees of the American Sail Training Association, dba Tall Ships America, may not participate as entrants. STATE, FEDERAL, AND INTERNATIONAL REGULATIONS: Winners must be eligible to participate in a sail training program on a Tall Ships America member vessel in good standing that is inspected and certified under CFR 46 subchapter T (Small Passenger Vessels) or CFR 46 subchapter R (Sailing School Vessels). The program must be of at least one week’s duration and include no less than six days at sea. JUDGES: Each complete submission will be read and evaluated by the staff of Tall Ships America. Each essay will be judged on the basis of creativity, passion, and how effectively the essay question is addressed. The top 5 entries will be selected by the staff of Tall Ships America. Winners will be notified by email on November 4, 2015. Awards will follow by mail upon completion of the sail training program and follow-up essay. The return of any notification as undeliverable will result in disqualification and an alternate winner will be selected. No substitution or transfer of a prize is permitted. DEADLINE: Entries must be received no later than October 28, 2015. Submissions should be emailed to Jennifer Spring with the subject line ‘NMSS Entry’; mailed to NMSS Program, c/o Tall Ships America, PO Box 1459, Newport, RI 02840; or faxed to NMSS Program, c/o Tall Ships America at 401.849.5400. ADDITIONAL REQUIREMENTS: Submission must include a completed ‘NMSS Entry Form’ along with the essay. In order to receive their full award, each contest winner must complete the sail training program and submit a secondary essay describing the value in the sail training program in which they took part. By submitting this follow-up essay, winners are consenting to its publication, along with the publication of their name and the program in which they participated, in any and all Tall Ships America promotional materials with no additional compensation given or further permission required. Tall Ships America maintains the right to edit entries before publication. The author retains copyright of his/her work. The Barque PICTON CASTLE has been sailing the worlds’ oceans for nearly 20 years in the wake of the great square rigged ships of the Age of Sail. Her epic voyages have already inspired hundreds of people to come together to sail, to explore this salt water globe and to seek to learn all that a ship on the open ocean has to teach. Our crew connect with people and places across the world. Transcending boundaries of geography, culture and race we return to villages where we have made friends, often bringing essential supplies, donated educational materials and medical care to some of the most remote and isolated communities on Earth. By working together we grow strong and learn to trust our shipmates and ourselves. By harnessing the power of the wind in our hand-stitched cotton sails we learn awareness and how to spot a problem before it arises. By watching the slowly processing stars on night watch, and the glorious ocean sunsets each evening, we learn to see the sublime in the every day. 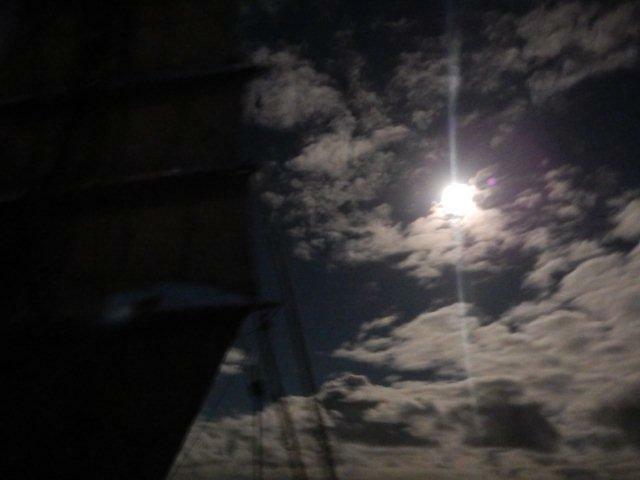 The things you learn aboard PICTON CASTLE, and the friendships you make aboard, last a lifetime. Aboard the ship right now, sailing westwards across the Indian Ocean, we have an exceptional gang of men and women of all ages and all backgrounds, hailing from a dozen different countries and every corner of the globe; Norway, Denmark, Sweden, Canada, USA, Tonga, Fiji, England and more. What brings them together is a commitment to experiencing a life at sea under sail, to the ship, her voyages; a down-to-Earth saltiness and a sense of adventure. Now we are looking for the next generation of mariners to join our crew and write the next chapter of the PICTON CASTLE story. No sailing experience is necessary – it’s far more important to be a good shipmate, though you must be reasonably fit. More than anything you must want to join us on this adventure and want to see the world beyond your horizons. Soon PICTON CASTLE will be rounding the Cape of Good Hope and entering the South Atlantic, there to sail up the coast of Africa and cross to the Caribbean calling at Grenada, Carriacou, Barbados and Dominica before heading north via Bermuda, to her homecoming in Lunenburg, Nova Scotia, Canada. After three years voyaging westwards around the world, it’s set to be quite the celebration. Join us in Cape Town, South Africa in January 2015 or in Cape Verde in March 2015. Sail with us as we cross the Atlantic Ocean, cross the equator and cruise the magical islands of the real Caribbean. We will be visiting friends we have made over the years, sailing our small boats in the crystal clear water and practicing beach landings on the perfect white sand. We’ll be sailing on and off the hook, tacking the ship about, climbing aloft and handling sails. We’ll learn sailmaking, rigging, small boat handling and celestial navigation, but first we’ll learn to sail our ship across oceans. If you’ve never been afloat before, or if you already have one foot in the sea and want to advance into traditional seamanship, then now is the time. 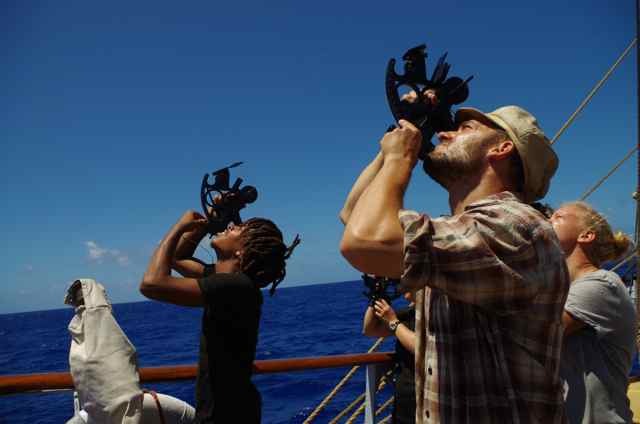 The world’s oceans and its trade winds are waiting, come join the adventure! Cape Town to Cape Verde, Jan 3 to March 20: Cape Town, South Africa to Luderitz Namibia, St Helena UK, Dakar Senegal, Cape Verde Islands. Cape Verde to Lunenburg, March 20 to May 16: Cape Verde, transatlantic to the Eastern Caribbean: Grenada and the Grenadines, St Vincent, Bequia, Dominica, Martinique, and other islands of the Caribbean, Bermuda and Lunenburg. WELCOME TO THE FIRST POST OF BLUE WATER BLOGS! FOLLOW THE ADVENTURES OF TALL SHIPS AND THEIR CREW AS THEY SET OFF ON OCEAN VOYAGES ALL OVER THE WORLD. Read more on Picton Castle’s Facebook Page. If you enjoy our ‘BLUE WATER BLOG’ posts, please follow our TALL SHIPS CHALLENGE(R) Blog.